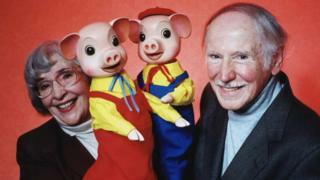 Vlasta Dalibor together with her husband Jan created Pinky & Perky, two puppet pigs that became a staple of children's television for more than a decade. The squeaky-voiced duo first appeared on the BBC in 1957 complete with their own fictional TV station PPC TV, which featured them performing sketches and singing songs. Vlasta and her husband had fled Czechoslovakia when communism was imposed after the war and arrived in Yorkshire with no possessions. Jan had modelling skills and Vlasta persuaded him to make two pig puppets - pigs were a token of good luck in Czechoslovakia. They were spotted performing in a summer season in Heysham and signed up by the BBC where their slot just before the six o'clock news brought them an adult as well as a children's audience. The characters reappeared as a CGI animation in 2008 by which time the Dalibors had sold the rights to their creation. Peter Mondavi was one of the pioneers of the Californian wine industry, instrumental in the drive to change the Napa Valley from a producer of nondescript vintages to one of the world's premier fine wine regions. The son of Italian immigrants, he began his career assembling boxes for his father's grape-shipping business before obtaining a degree in economics and then studying oenology. His parents had bought Charles Krug, a Californian winemaker and, on his return from war service in 1946, he involved himself in the business. He pioneered the process of cold fermentation of white and rose wines, which allowed them to keep their fruity characteristics. Mondavi believed his greatest achievement was keeping his wine business within the family, resisting the approaches of large corporations. He credited his long life - he was 101 when he died - to good genes, hard work, pasta and a glass of wine each day. Jackie Mattson was one of the stars of the popular but short-lived women's professional baseball league, which was in existence in the US from 1943 to 1954. It was founded to maintain the game while many male players were engaged in the war, although previously the idea that women would play professionally was frowned on. Mattson began playing scratch street games with local boys as a child and eventually secured a job as a practice catcher for a men's team. After a spell with an amateur team, the Milwaukee Jets, she was signed up for the professional league in 1949, joining the Springfield Sallies based in Illinois, for whom she played 48 games. Strict rules about appearance were enforced with every player receiving a beauty kit and instructions on how to use it. They were also banned from smoking and drinking in public places. The league disbanded after failing to attract either new players or the sponsorship needed to continue. David Menhennet was largely responsible for the transformation of the House of Commons library from an area of repose beloved by sleeping MPs to an authoritative source of statistics and information. Born in Redruth, Cornwall, he studied French and German at Oxford before becoming a clerk in the Commons library in 1954. Put in charge of the research area he introduced daily briefings for members on topical issues. He was keen to replace the antiquated archives that bewildered both library staff and MPs, and, when appointed librarian in 1978, set about modernising the systems. Electronic publication and computers were introduced, making it much easier to find and cross-reference facts and figures. A new generation of thrusting MPs took advantage, notably Gordon Brown and Tony Blair, who tried to use a battery of statistics to embarrass the Conservative government. His last reform was to propose a ban on smoking in the library. Jazz trumpeter John Chilton was best known for his band, the Feetwarmers, who backed George Melly - a vocalist well-known for his love of bawdy songs and exuberant stage performances. But Chilton already had a long and distinguished career as a musician, having become hooked on jazz as a teenager. He perfected his playing during a series of office jobs and a spell of National Service and turned professional with his own band in 1958, launching with a summer season at Butlins in Skegness. He had a brief foray into pop, in charge of PR for The Swinging Blue Jeans who had a fleeting moment in the chart spotlight, before returning to jazz, both playing and writing books on the music's history. He disbanded the Feetwarmers in 2002 and went back to his roots, playing sessions in London pubs. It was a stipulation that he would not perform anywhere that could not be reached on a red London bus.